It’s been a while, since I actually had fun watching cheesy and cliché humour. 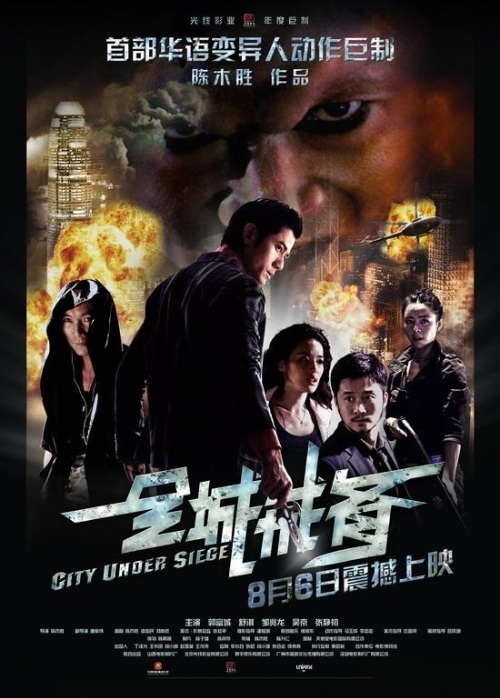 The latest Benny Chan’s sci-fi action extravagant, City Under Siege is an outright cheesy movie that one can either enjoy or doss with respite. Aaron is on the back of a string quality acting roles, returns to his former self as the poster boy of expensive action displays. Not unlike, 2000AD and his 90s antics, Kwok plays a rather simple and empty character that aims to deliver the cheesiest lines in HK cinema. A prime example will be the moment that Kwok starts to woo Shu Qi on screen, out goes the background music sang by Kwok. It reminded me of the days when Kwok used to woo Kelly Chen in too many 90s rom-com. Still, I burst out laughing in the middle of the cinema. Embarrassed, may be a little, but shameless I was. By the time, the film credits were rolling rigorously, I have already laughed out due to extreme cheesiness a hand full of time. Is the film bad? Probably, but the unintentional humour brought a cheesy taste within my tongue. Aaron Kwok kicks of the title of the most hideous laughing clowns in town. He is a genuine, laid back and simple-minded person who aims and strives to take the stage and throw some knifes. In fact, that is his lifelong goal. Mr. Colin Chou overacts immensely over-the-top and the result is a performance that is both hilariously bad and also his funniest role of his career. Shu Qi is still pretty enough to justify an eye candy presence, despite being overhaul by a rookie newsreader (played by Chrissie Chau) due to having a bigger pair of candies. Still, Kwok and Qi lack chemistry, but due to the nature of the movie, it leads to further funnier moments. On the other hand, Zhang Jin Chu continues to still the show in a sympathetic performance and martial artist Wu Jing shows that he is superhuman without being a mutant. In fact, one can highlight the somewhat anticipated fight scene between Jing and Chou, but the fury pacing ruins any sort of enjoyment in that scenario.